As we have seen, most earthquakes are essentially the product of tectonic stresses which are generated at the boundaries of the Earth's tectonic plates. The released energy travels as shock waves, called seismic waves, which may be felt and measured. The study of seismic waves is known as seismology, a word derived from a Greek word meaning "to shake." Seismographs are the instruments which record earthquakes. Scientists use these instruments as their principal tool to study seismic waves. They are very sensitive instruments that can detect, measure and record ground vibrations and their intensities during an earthquake. A seismograph is a simple pendulum. As the ground shakes the base and frame move with the vibrations but inertia keeps the pendulum bob in place. It moves relative to vibrating ground. 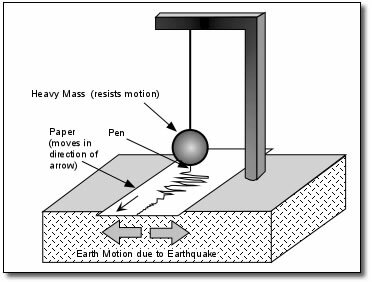 The pendulum displacement records the changes over time the tracing out the record of the event is called a seismogram. The image above shows the seismograph in Sunset Crater Volcano National Monument's visitor centre. A pen at the top of the device records a zig-zag line on the moving, paper-covered cylinder whenever an earthquake is detected. The seismogram (paper record) is removed each day and replaced. The earthquake data from the seismogram is then analyzed by scientists. Seismographs can help us determine the time, epicentre, focus, and the type of faulting which produced an earthquake as well as estimate how much energy was released. The severity of an earthquake can vary from events which are barely detectable even using the most sophisticated devices, to devastating events which can level cities and trigger Tsunamis and sometimes even volcanic activity. The severity of an earthquake is called its magnitude. 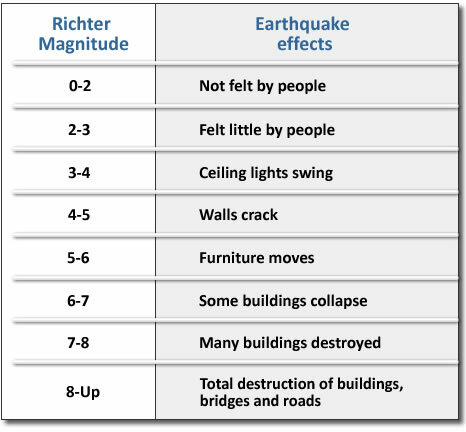 Various scales were proposed to measure the magnitude of earthquakes until 1935, when the Richter Scale was developed by a seismologist named Conrad Richter to measure the intensity of the seismic waves. where Log refers to the logarithm to the base 10, E is the energy released in ergs and M the Richter magnitude. Tectonic earthquakes can range in size from magnitudes less than zero, resulting from fault slippage of a few centimetres, to the largest events (magnitude greater than 9), where fault displacements are on the order of many metres. Earthquake size is determined not only by amount of displacement but also area of the ruptured fault plane. Hence the larger the rupture area, the larger is the earthquake. A magnitude 7 earthquake ruptures a fault area of about 1000 km2 or about 50 km long and 20 km wide. Also depth is an important factor influencing earthquake severity. We know that earthquakes can originate at various depths within the Earth's solid core. The deeper the earthquake, the more powerful it is, but it is also far less likely to reach the surface. That's why shallow earthquakes are more common and more dangerous, because the shallower an earthquake, the more damage to surface structures it can cause. There is no limit to the possible magnitude of an earthquake but historically just over magnitude 9 is the record. 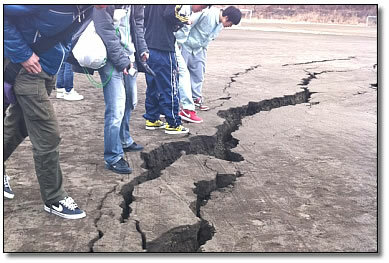 The earthquake of most recent history to reach 9 on the Richter scale was the Japan quake of March 2011. This was also the largest recorded Japanese earthquake of all time.